1865: Charles Dodgson, writing under the pen name Lewis Carroll, published Alice's Adventures in Wonderland. 1867: The Blue Danube by composer Johann Strauss was the top musical hit of the year. 1867: Alexander Muir wrote The Maple Leaf Forever as a patriotic song for the newly confederated country of Canada. It served as Canada's de facto national anthem until O Canada was composed in 1880 and became the official anthem. Muir was an amateur musician. He made his living as a school teacher and later as a principal, teaching at schools in Toronto, Newmarket and Beaverton, Ontario. 1867: Mary Shelley wrote Frankenstein. 1867: Karl Marx published the first volume of his famous analysis of capitalism, Das Kapital. Eventually reaching three volumes, this work would provide the theoretical basis for Communism. 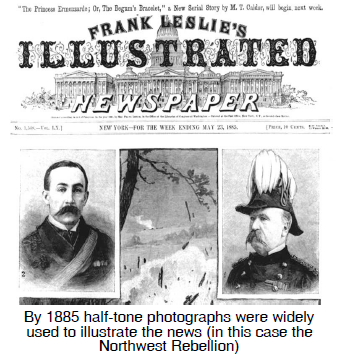 1869: The Canadian Illustrated News was the first periodical in the world to use half-tone photographs instead of artists' engravings. Georges-Édouard Desbarats, publisher, developed the process with engraver William Leggo.